Lock in a great price for Holiday Inn Express & Suites Las Vegas SW Springvalley – rated 8.3 by recent guests! The staff very nice people working there and the place it self is very accommodating. I like to have my one night money back to my account instead of charging me 2night they charge me 3night pls look in to this and refund my money ASAP as one is of your staff promise that they will refund my money till now the money is not reflect on my account yet thank you . The staff was very welcoming. Rooms and lobby was kept very neat. The hotel is very close to the strip, so this is the best affordable place. Pleasant staff. Lobby exceedingly clean. Complimentary breakfast was clean and well organized. The breakfast bar was amazing! Omelettes, cinnamon rolls! So yummy. Friendly staff. Super clean. Even though they were doing extensive renovations, I never once felt inconvenienced. Location, location, location. Cleanliness, quiet. I only stayed in the room a few hours each night, so I don't have much to report about. Check in is fast and efficient. Rooms are very clean. Extremely convenient location. All the staff go above and beyond to make your stay amazing. The breakfast hours are generous as is the selection! Something to please just about anyone is available. The dining room is well laid out, spacious and well attended (clean). Outside parking has some smaller spaces IMO and can be difficult to find a convenient spot to park sometimes. Clean rooms, very nice staff, breakfast in the morning was very nice! 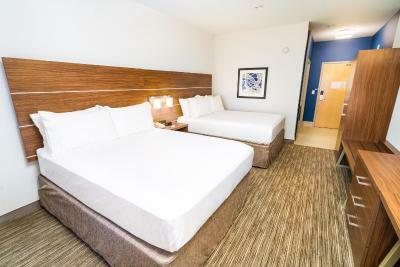 Holiday Inn Express & Suites Las Vegas SW Springvalley This rating is a reflection of how the property compares to the industry standard when it comes to price, facilities and services available. It's based on a self-evaluation by the property. Use this rating to help choose your stay! 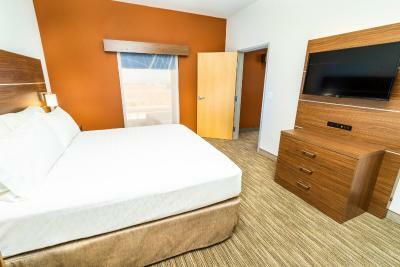 Holiday Inn Express Las Vegas I-215 South Beltway features an outdoor poll and fitness center. Guests can work in the business center or use the free wireless high-speed internet access that is available throughout the entire hotel. 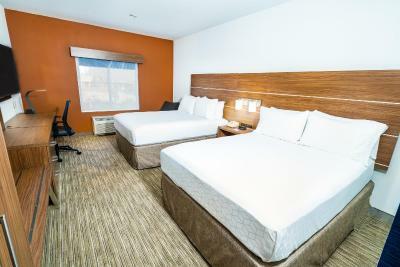 The guestrooms at the Las Vegas South Beltway Holiday Inn offer comforts such as mini-refrigerators and microwaves. After a busy day, guests can watch cable TV or take advantage of the spacious, in-room work area. When would you like to stay at Holiday Inn Express & Suites Las Vegas SW Springvalley? Bed type preference cannot be guaranteed as it will be allocated upon arrival based on availability. This is a non-smoking room. Featuring free Wi-Fi and a flat-screen TV with cable, this spacious room includes a small refrigerator, a microwave and coffee-making facilities. Featuring free Wi-Fi and a flat-screen TV with cable, this spacious suite includes a small refrigerator, a microwave and coffee-making facilities. This double room features a view, microwave and satellite TV. House Rules Holiday Inn Express & Suites Las Vegas SW Springvalley takes special requests – add in the next step! Holiday Inn Express &amp; Suites Las Vegas SW Springvalley accepts these cards and reserves the right to temporarily hold an amount prior to arrival. Holiday Inn Express & Suites Las Vegas SW Springvalley accepts these cards and reserves the right to temporarily hold an amount prior to arrival. The stay was great. But when checking in I asked about restaurants and they mentioned one and then said I could Google it. After driving 10 hours I was exhausted and just wanted a suggestion. Also when checking in I asked for 2 beds and they didn't have any available which was ok but then to tell me that because I booked on a discount website I shouldn't have expected one. It wasn't rude just degrading. The stay was great and it was really clean. They gave a room next to the employee and it was load and dnt get any sleep. Never had the room serviced during the whole stay. Asked to have this done twice. Was told that at times they don't have time to clean the rooms. No way to run a hotel. Dirty floors to greet you outside...all the way through elevators! Horribly noisy room heating system. The shower handle didn’t work very well and the water wasn’t very hot. It's a bit worn and there is a mild musty smell in halls and rooms that seems to come with older hotels. Very friendly front staff and breakfast staff.